While browsing through the meat department the other day at my local market, I saw some beautiful homemade sausages that were calling my name. I bought two — a portabello mushroom stuffed sausage and a chicken apple sausage. As I walked home with my groceries, I thought about how hungry I typically feel after eating a sausage — it just didn’t seem like enough food although it certainly carries the calories to count for a meal. How could I spruce this sausage up without taking away its flavor focus? 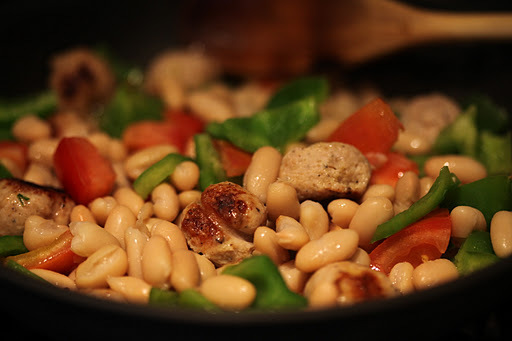 I decided the best approach would be to cook up some peppers and onions — and then mix in some additional produce and one of my favorite pantry items — white beans, also known as cannelini beans. I took out my favorite pan and filled it with about an inch of water which I brought to a simmer. I decided to poach the sausage to cook it most of the way through rather than pan fry it since it would provide me the time to chop all my veggies up. I also feel like the sausage is cooked more tender this way and there’s a smaller risk of undercooking. However, I won’t lie to you — poached sausage looks pretty unappetizing. I like to slice my sausage before cooking, but you can cook it whole as well. I chop up some onions, green peppers, green onions, and kale. If you’ve never had it, kale is super high in nutrients and is considered a good cancer-fighting food. Like any green or cabbage, it’s a vegetable that can go into almost anything — my only advice is to add it to your meal towards the end so it isn’t overcooked. Keeping it a little crisp and fresh helps to retain the nutrients. My sausage seems to be cooking nicely by now, and I drain the water and add a little olive oil in the pan to start browning the sausage. Along with the sausage, I add the chopped onions and stir until they grow somewhat translucent. The kitchen is smelling great now, and even better when I add the chopped peppers to the pan. I’ve learned that green bell peppers are cheaper than the red or yellow ones, both of which tend to have a sweeter flavor. I used to think green peppers were boring but have really grown to love the added flavor they bring to a dish. Again, the trick for me is to not overcook them. I like them to still have a little crunch as I bite into them. Even when sauteed, the peppers retain their juiciness. Adds a real sense of fresh to my meals. As the sausage, onion, and peppers are cooking up nicely, I add the spring onion and 1/2 a can of drained cannelini beans. The beans add a bit of moisture to the pan which helps to make sure I don’t burn anything. I add some minced garlic, coriander, cumin, Cavenders, salt, and some fresh mint leaves from my plant. The beans are soft enough that they’ll compress into mush if flattened with a spoon, so I drop the heat to low and top the pan with my torn kale. I cover the pan to let the steam cook the kale through for about a minute and turn it off. In a separate pan, I fry up a couple eggs for an added source of protein. Sausage, veggies, beans, and eggs. This is a perfect meal in about 30 minutes. Sorry for not having any more pictures of the actual cooking process. Total cook time, approximately 20 minutes plus 10 minutes to prep. ← My Top Ten Go-To Spices.